BERLIN, Germany, Oct 13, 2016 – With the upcoming release of the iOS version of ARES Touch in November 2016 and the follow-on release of ARES Kudo in the following months, Graebert GmbH, announced that its ARES CAD software will be the first to offer a “trinity” of DWG-based CAD solutions covering the three major platforms: desktop, mobile and cloud – all within the same subscription. With the release of ARES Commander 2017 in November, Graebert will introduce a new dark color scheme in its user interface, harmonizing the look and feel of the three products. The new user interface aims at offering a consistent user experience and facilitating a better sharing workflow. The trinity concept will also impact licensing, with a new customer portal allowing each user to manage licenses and rights across all their computers and devices. 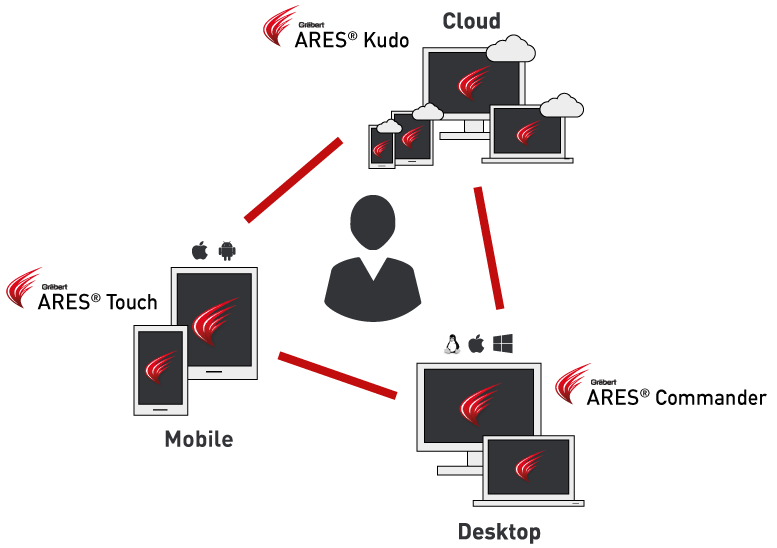 The ARES CAD software share a common subscription structure, allowing the same user to work from several computers (ARES Commander for Windows, Mac or Linux), mobile devices (ARES Touch for Android and iOS) and the cloud with the upcoming ARES Kudo. Unlike many players in the software industry, Graebert takes pride in offering the choice between an Annual Plan and Perpetual licenses. The Annual Plan is an all-inclusive subscription that will include the three products, for the flat yearly fee of 250 USD in Americas or 250 Euros in Western Europe. The Perpetual license includes, for 795 USD in Americas or 795 Euros in Western Europe, an unlimited license of ARES Commander for one computer and a renewable one year subscription including ARES Touch and ARES Kudo. Prices may vary in other regions. The features of ARES Kudo will be gradually released and synchronized with the release of the Service Packs of ARES Commander 2017. The first version will be introduced with viewing and sharing capabilities by the release of the Service Pack 1 of ARES Commander 2017. The editing features will be further deployed together with the following Service Packs. Graebert is a leading developer of CAD software, solutions and services. They are recognized as a true innovator in the CAD industry and have more than 30 years of expertise. Their DWG-based CAD systems were the first to run on Windows, Mac and Linux. Graebert is also a pioneer in mobile CAD technologies on Android and iOS. Most recently, Graebert announced ARES Kudo, a full DWG-based CAD platform for the Cloud. Graebert‘s product portfolio is anchored by the ARES CAD software – a powerful suite of DWG-based CAD software for desktop, mobile and cloud – which also enables developers to create standalone CAD applications. Overall, millions of professionals use their CAD technologies in more than 100 countries. They also specialize in building surveying software and services. The SiteMaster line of “as built” surveying solutions, as well as worldwide surveying services are included under Graebert‘s iSurvey brand and division. This entry was posted in CAD-CAM-CAE, Featured News on October 13, 2016 by Sharmila Guha.